Is the big day coming up? Or your friends? Do you need something to wear while preparing for the special day? Or are you having a spa day hen party? 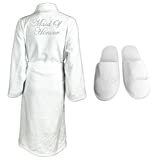 If so, then you cant go without our customized bridal towel bathrobes and Spa Slippers. The bridal name is designed and manufactured here in the UK using high quality machine cut glass crystals. Small crystal The bride on the front and a larger version on the back.